It feels like forever since I posted an entry. Ive been crazily busy at work and my brother visited me for Thanksgiving, so was busy showing him around and cooking for him. I did take pictures of dishes that I made but did not have the time to post. I hope to post more regulary now. This is one easy instant recipe that I make a lot when I am too tired to cook after a long day at work. You can either start it from scratch or use already made tomato thokku. I store 2 bottles of tomato thokku in the fridge and use it whenever necessary. Heat oil is a big pan and add the seasoning ingredients. Once the mustard starts to splutter add chopped onions. Fry the onions till they turn translucent and then add the peas. Once the peas are half cooked add the tomato thokku and cashews. Simmer in medium heat for about 10 min and then add cooked rice and stir well. Lower the heat and cook till the rice mixes well with the thokku. Remove from heat, garnish with coriander leaves and serve with raitha and chips. This is an ideal dish to pack for picnics. deepz this is a good dish esp for me .. i make thokku which i learnt from ur blog only but it always get over immd after i make it .. for making a bottle of thokku how many tomatoes do i need? 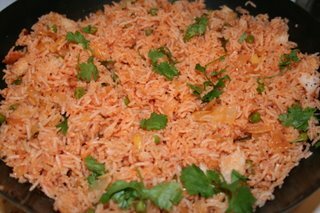 Tomato rice looks amazing. Loved the color of the tomato rice contrasted with the corrainder leaves.